Chimney up the deep slot with the white-yellow slots. Place a friend in the upper one and swing up and out right to the holds and a slot for a bomber #6 hex. Move up and right to join Gone with the Wind. 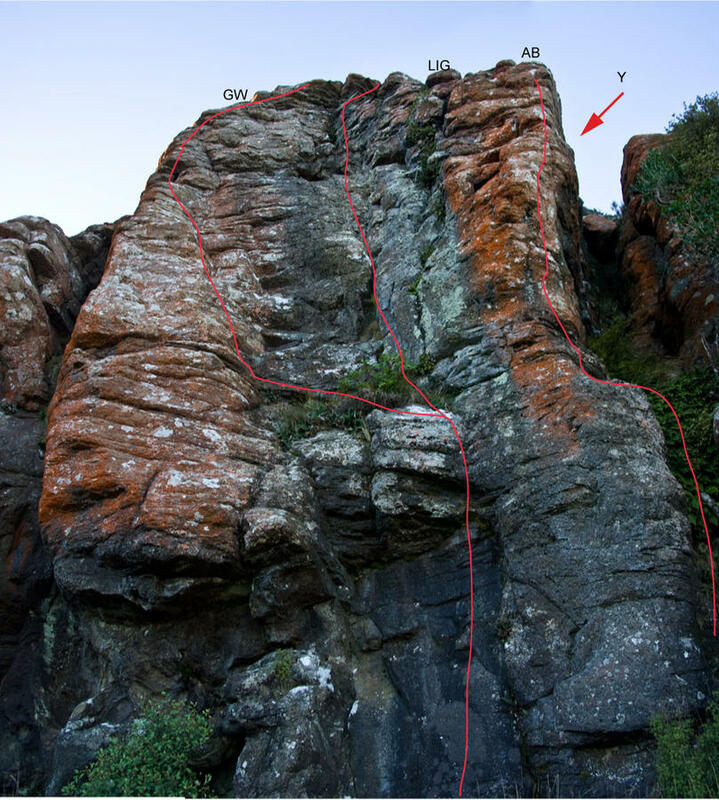 Next pro is a thread at the top of the arete. Committing. The crack on the wall between two chimneys. Tackle the low bulge on the right, then up top wall. Protection just adequate. 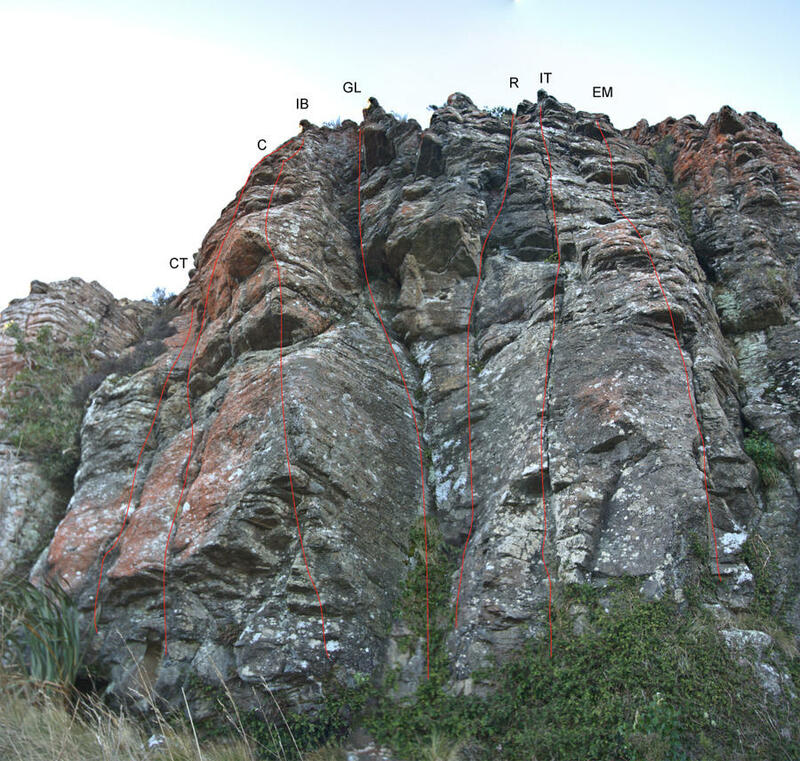 The arête right of L.I.G. started by climbing Skunk to ledge at 3m. Then climb straight up arête with spaced protection. (Snelder and Tweedie) Lindsay Main climbed left wall on first ascent. A clean crack line on wall left side of skunk gully, discovered on guide book check. Quite good. The deep poxy chasm with a large root at the bottom. Also a descent route. The wide crack just right of an arête 2m right of Skunk. Gross. The wall to right of Sinking Ship. Start up Sinking Ship to the bulge, place runners and move up right to bolt. Continue to top. A direct start to Social Ostractye. Boulder tricky moves at bottom of thin crack,then easier top. Starts up crack 2m left of Gooders Line and then proceeds up crux on bulging arête. Good protection, #2 friend and wires at crux. Top arête is scungy and unprotected. Direct line up the arete left of Gooders Line. Start under the prong (don't worry – the epoxy resin holding it in place seems to work), make powerful moves up to clip the first bolt, then swing around left (crux) to a good stance on the hanging slab. Move back right onto the arete and proceed up on good holds to another crux moving up past the third bolt to get established on the sloping prow. Then easily up to the belay. 3 bolts, double eyebolt belay. Prominent right facing corner, good technique avoids thrutching up the top offwidth looking section. The best of the early routes here. Good protection. Up the wall and through the bulgy wall and roof 2m right of Gooders Line. Good protection. Upper section gets dirty after rain. Start up the thin crack 3m right of Gooders Line. Move right to upper bulges and up to the top. Protection adequate (#1 ; #2 Friends). The totally overgrown corner right of It’s Tough at the Top. Not the best. Faint corner L of Dumping Velvet. Wire at the start clip the 2nd bolt of D.V. Bold. Climb directly up the wall using layways and one goodish hold 'til you reach the first bolt. Bridge up on easier ground to the 2nd bolt, then commit up the steeper, fingery wall. 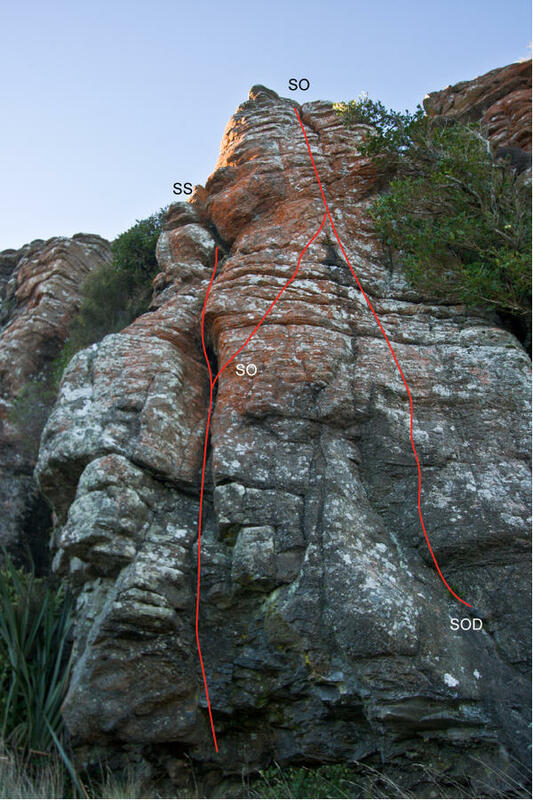 Above this holds improve – keep going (possible medium nut placement) 'til you reach a good ledge and the belay. 2 bolts, plus double ring belay station. Runout to the 1st bolt (watch you don't end up in the bushes) and above the 2nd bolt (the one wire comes somewhat too late) – not a sport route! Climb the arête right of Dumping Velvet. where the cliff turns a corner. Pretty ugly.